Increasing focus on distribution for easier availability for consumers, sovereign gold coins are likely to lead goldcoin sales in the next one year due to trusts of purity created by the government through BIS (Bureau of Indian Standard) hallmarking. Launched on November 5, 2015, the government-ownedMMTC Ltd is India’s largest gold importer and the sole manufacturing and marketing company of sovereign goldcoins. It sold 185 kgs volume of gold coins and bars in the denominations of 5 grams, 10 grams and 20 grams. MMTC sells its products at around 9 per cent premiums over the prevailing market price in Zaveri Bazaar. As against the market price of Rs 30,025 per 10 gms of goldwith 0.999 purity (announced by the India Bullion and Jewellers Association), sovereign gold coin of similar denomination was quoted at Rs 32,710 per 10 gms. Presently, gold coin markets are dominated by local jewellers with individual jewellery retailers introducing their own brand with claims of quality guarantee with BIS certification. These temper proof coins have equal re-sale value across all jewellers sans making charges. “The biggest constraint for sovereign gold coins sales was limited distribution network. Along with its 26 owned outlets, MMTC distributed sovereign gold coins through around 200 outlets overall. So, competing gold coins sales of MMTC through 300,000 – 400,000 jewellers is not a natural significator. So, despite so much of constraints, MMTC was able to sell so much. Since, the policy constraints were also by and large resolved by the Reserve Bank of India, banks are warming up to ink pacts with MMTC to sell sovereign gold coins. We believe its distribution would be very widespread one year hence across banks and some large jewellers. So, sovereign gold coin is likely to emerge as a single largest branded gold coin in medium term,” said Somasundaram PR, Managing Director, India, World Gold Council (WGC). According to WGC, four banks have signed pact with MMTC of which Indian Overseas Bank (IOB) leads in the retailing of sovereign gold coins. Banks are also integrating themselves for goldmonetization scheme (GMS). “We have successfully sold Indian gold coins to the tune of 185 kgs since launch. The research echoes consumers’ preference for the Indian gold coin as it is backed by the government and is a quality product. Apart from MMTC outlets, the Indian gold coin is currently available at four banks — Indian Overseas Bank, Federal Bank, Vijaya Bank and Yes Bank. The total number of outlets is close to 200 and in the near future, our focus is to strengthen distribution by signing up more banks and India Post to ensure it’s available to consumers across the length and breadth of the nation,” said Ved Prakash, Chairman and managing director, MMTC. Interestingly, sovereign gold coins might play a significant role in exports as MMTC is looking to make these coins available at different tourists’ places. In India, gold coins are also sold in 1 gm and 2 gms denominations. “Not only for coins but the ongoing festive season also looks very good for jewellery sales as well,” said Prithviraj Kothari, managing director, RiddiSiddhi Bullions Ltd, a city-based RSBL brand coins retailer. According to trade sources, however, the success of sovereign gold coins would also depend upon gold collection through GMS from Indian households which own an estimated 22,000 tonnes. 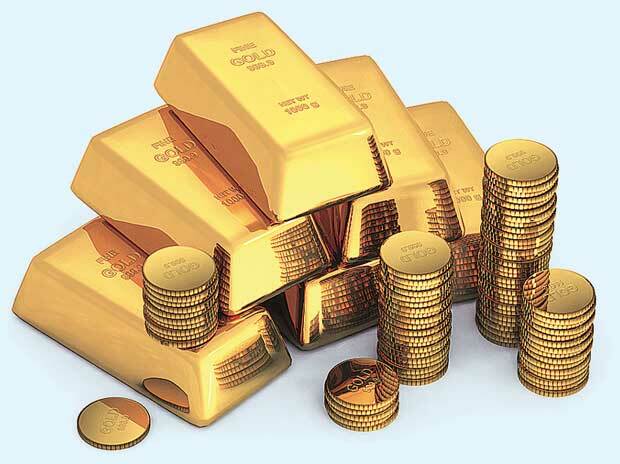 India’s gold demand was estimated 131 tonnes during the April-June quarter of which investment demand (coins and bars) contributed around 25 per cent.